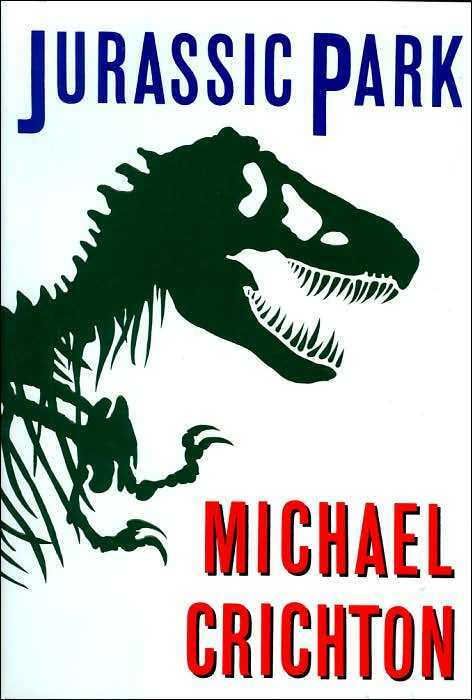 The Billionty-Oneth Geek: Michael Crichton's JURASSIC PARK!!! 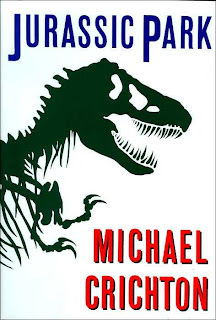 This week I finished reading this little book called Jurassic Park. You may have heard of it. It was adapted into a movie by one Steven Spielberg in 1993, which I think a few of you saw. Anyhow, it's kind of funny. I've never read the book before, but I did read The Lost World, the sequel to this book back when I was 14 years old, in anticipation for the movie sequel. If you need a rundown, here it is in 5 short sentences. Old billionaire tycoon creates a park on an island in Costa Rica. He successfully funds research in recreating dinosaurs from rare DNA. He invites a bunch of people to check out the island. The power goes out. Carnage ensues. Okay, they're not really sentences. It's always interesting to read the book after you've seen the movie. Instead of having your imagination paint the world described in the pages of the book, the world is kind of built for you already from all the visuals you saw in the movie. Whereas if you went the other way around, it's more of your own fantasy. The movie is definitely a more streamlined and action packed version of this book. The best way I can put it is that they really trimmed the fat. There's a lot more dialogue between Ian Malcolm (Jeff Goldblum's character) and the scientists in discussing different theories and philosophies. Clearly, not cinematic though. What's more interesting is that there are a number of characters who had only a few lines in the movie, but are completely fleshed out characters in the book. Particularly, Dr. Wu (the asian scientist guy, remember? ), Harding (the doctor that was looking after the sick triceratops, remember? ), and Arnold (Samuel L. Jackson, of course you remember!). There's even some change in who lives and who dies, so even though there was a lot I expected having seen the movie, I was still left with some intrigue in reading the book. Also, some of the scenes that happened in the book were missing from Jurassic Park, but were instead placed into The Lost World and Jurassic Park III movies. It's still a good read and it is action packed, which made the 400 pages go by pretty quick. But having read it now, I think I can clearly say that I enjoyed the movie more. Trimming the fat was good. And plus, no imagination can compare to one Jeff Gone-Goldblum. Til next time, later geeks!